In the last few years, the commercial vehicle landscape has changed. The traditional “work van” has been replaced by Mercedes Sprinters, Ford Transits, Nissan NVs, and most recently, the Ram ProMaster. Alongside these workhorses have come smaller compact commercial variants. The 2010 Ford Transit Connect was the first to hit our shores, followed by the Nissan NV200/Chevrolet City Express Twins. 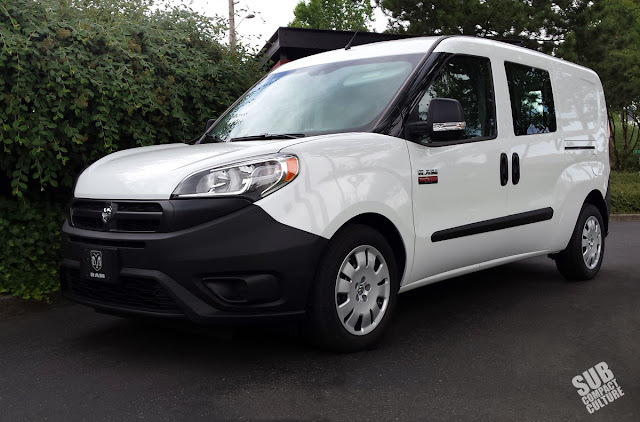 Ram is now also offering a smaller commercial van in the form of the Ram ProMaster City. Ideal for urban deliveries, mobile businesses, and perhaps a miniature RV, these smaller van variants have dotted the European landscape for years. In fact, the Fiat Doblo—the European version of the 2015 Ram ProMaster City—has been used as an RV on that side of the pond for years (the Doblo has been offered since 2000). When the van was delivered to me, the first thing I thought about was how this might make a great travel rig. I know the super overwhelming majority of these ProMaster City vans will be used for delivery duty or work purposes, but I kept thinking that this would be a great little RV or overland rig. Yes they’re front-wheel drive and 4WD or AWD isn’t an option. 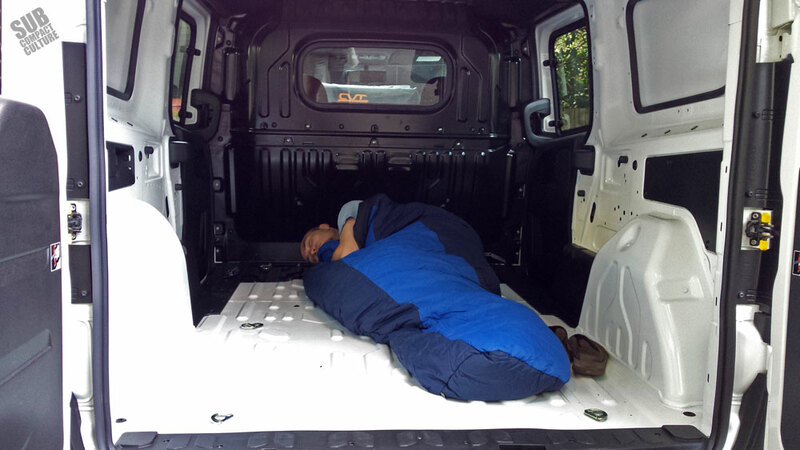 However, with the space, the size, and the versatility, the ProMaster City might just make a great travel rig. The Ram could be a modern day VW Westfalia van in front-wheel drive. Yes, it’d be great for the handyman, the mobile dog groomer, the urban delivery person, or other business applications, but the idea of taking one of these vans and outfitting it for travel across the country (or farther) is super appealing to me. The ProMaster City's doors open wide to accept large cargo. The van has 131.7 cubic feet of cargo space, which is quite generous. For comparison, a 2015 Scion xB has about 70 cubic feet; a full-size Chevrolet Express has The 153 cubic feet. ProMaster City also bests its compact Ford and Chevy/Nissan rivals by as much as nine cubic feet when it comes to cargo. 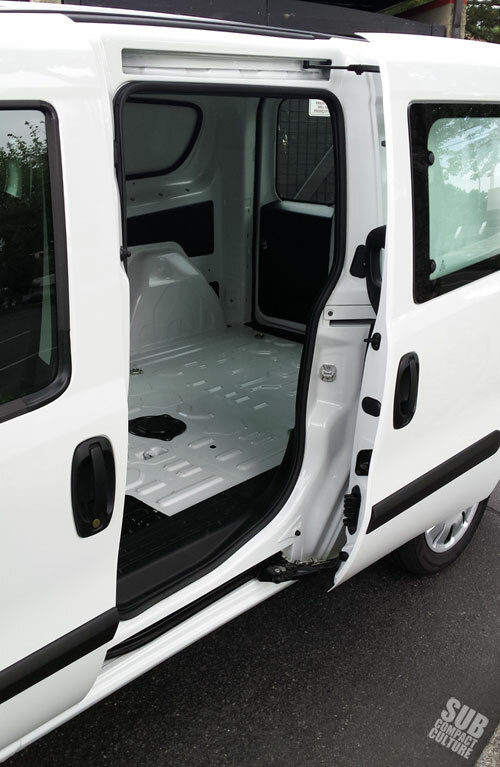 Our version, the ProMaster City Cargo, featured a sliding door on each side and double doors at the rear in addition to the driver and passenger doors, which allows for easy access no matter what side of the van you’re on. Our tester also featured the optional bulkhead that separates the driver/passenger area from the cargo hold. This cuts down on road noise, too, which we found to be very tolerable. There is a fair bit of wind noise—not surprising considering the vehicle is the shape of a Reebok high-top shoe. 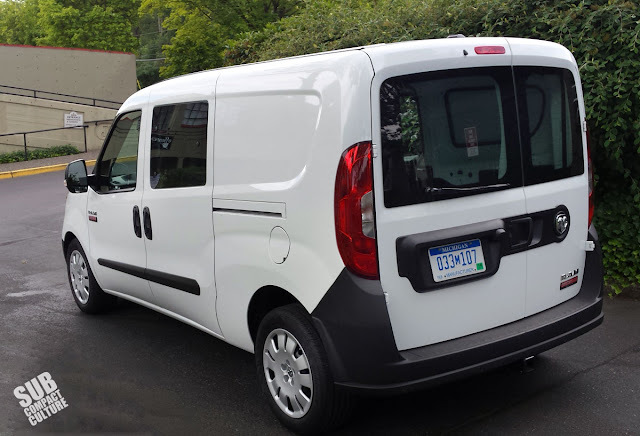 Speaking of shape, the ProMaster City looks decidedly European. It also has quite the snout one it. Our model had unpainted front and rear bumpers, which are fine for utilitarian duties. I'd hesitate to call it attractive, but I also wouldn't call it ugly. It's kind of like a pair of European work boots. Our model also had glass in both the sliding doors and rear doors, which is optional. No fancy alloy wheels on this ProMaster—it's 16" steelies and hubcaps. If you were to use the ProMaster City as a camper, there’s enough room for a couple of sleeping bags, but if you were to turn this into an RV, you’d have a couple of fixed or folding beds. My 5’7” frame had tons of rooms for a sleeping bag, and there’d be lots of space for gear, too. A good racking or shelving system would be ideal adventure seekers looking to reside in the ProMaster City’s cargo area. There was also a 12V outlet in on the driver’s side rear as well as some built-in storage areas. Add some hooks and you’d have yourself a good platform to actually camp in. The ProMaster City's interior was nicer and more refined than I expected in a commercial vehicle. Up front, the ProMaster City’s interior is much less utilitarian than I expected and it’s quite comfortable. Unless you’re something like 8-feet tall, there’s plenty of headroom, plus the ergonomics are good. A couple grumbles: The seating position is weird. I felt like I sat in a mildly canted-backward position (think bucket-style seats). I also wish the amber instrumentation was brighter. There are trip, temperature, and fuel economy displays, too. I liked the fact you can easily see the end of the van’s hood, which is great for urban driving. Rear visibility is not great, however, despite the window in the bulkhead and dual windows at the back. 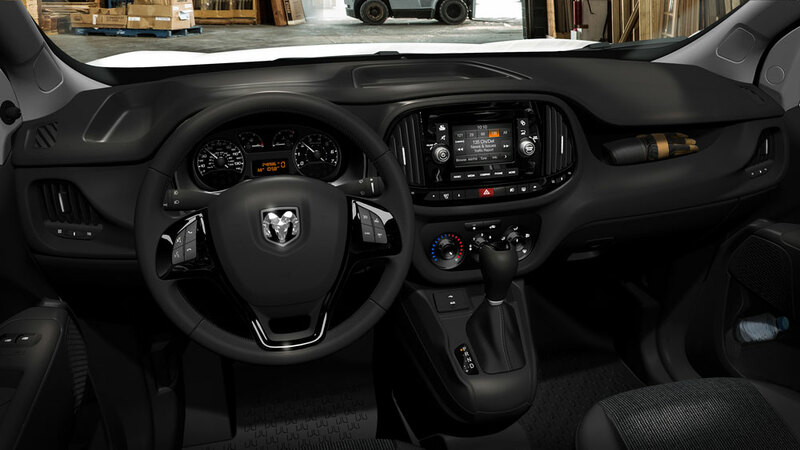 It’s a good thing the Ram has convex mirrors on the side mirrors—you’ll need them every time you change lanes, especially if you opt for that bulkhead. There are numerous cubbies, an overhead storage area, and plenty of other places to stash gear. Depending on what you were going to be using the van for, you may or may not want to opt for the bulkhead. If I were to use this as an overland vehicle, I’d nix it. If I were hauling fish to market, I’d want it. Despite my want for an AWD or 4WD variant, the good thing about the FWD platform is that without a need for a rear driveshaft, Ram can keep the rear floor flat and can also have a low rear cargo deck. So no matter if you’re hauling tools, gear, or people, entry and exit is easy. Under the hood, the Ram is powered by the FCA staple 2.4-liter MultiAir engine that is also in, well, nearly everything FCA offers these days: the Chrysler 200, Dodge Dart, Jeep Cherokee, and Jeep Renegade. The mill is mated to the equally ubiquitous nine-speed ZF automatic transmission. Horsepower comes in at 178; torque is rated at 174 lbs/ft and allows the little front-drive ProMaster City a towing capacity of 2,000 lbs. I was surprised how peppy the vehicle was around the city, with 0-40 MPH seeming to pass by rapidly. No, it’s not some sleeper of a van you’d do deliveries on Friday and bring to the drag strip on Saturday, but it does have enough power to get out of its own way. The engine does make a fair bit of racket. The transmission—all nine gears of it—can get a bit confused around town and it hunts more than I’d like. What drove me nuts, however, was the amount of vibration produced when the Ram was at a standstill and the transmission was in drive. It vibrated way more than it should. If I owned the van, I would bring it in for service. Two surprising aspects were the Ram’s ride quality and its brakes. Firstly, Ram is the only small cargo van that offers a fully independent suspension with coil springs all around. 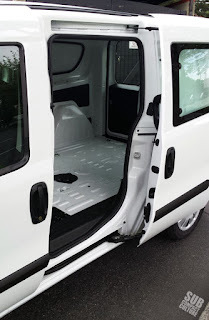 Both the Transit Connect and City Express/NV200 have twist beam rear axles and leaf springs. And while not exactly meant for the racetrack, the Ram handles confidently with a fair bit of lean in the corners and rides comfortably on the highway. Steering is mediocre and there isn’t much feel. But hey—this is a Ram van not a race car. Despite the ProMaster City having drum brakes in the rear, the brakes do a great job of stopping the 3,512 lb vehicle all with decent brake pedal feel. 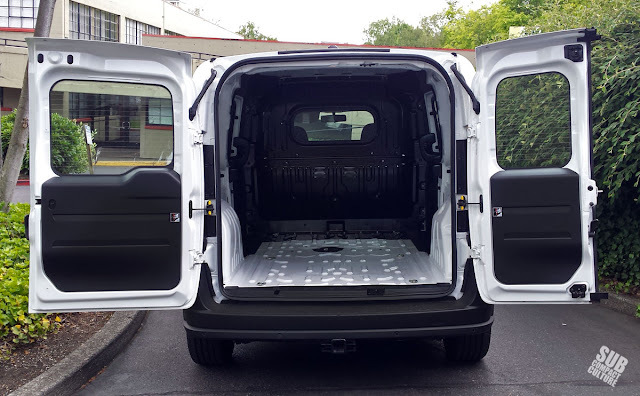 If you still can’t get a good idea of the size of the ProMaster City, its wheelbase is 122.4”. A 2015 Scion xB has a 102” wheelbase. The Ram’s overall length is 187.5”, whereas a Scion xB is 168”. So while it’s not a dainty little thing, it’s still pretty small for a van. The full-size ProMaster starts at 213”, by comparison. The ProMaster City is EPA rated 21 city, 24 combined, and 29 highway—not too shabby for what it is. It certainly wouldn’t break the bank in terms of fuel economy. Fancy it isn’t, but for a cargo carrier, I couldn’t help but like it. Our tester came with the optional trailer tow group, back up camera group, aforementioned cargo partition, Uconnect 5.0 infotainment (which had satellite radio), hubcaps, row and rear windows, and a rear wiper washer. This amounted to $26,580, although the base price is $23,130. I was impressed by the Ram ProMaster City, and frankly, I kind of want one for a travel vehicle. It has nearly everything you’d need to make a cool camper, although I’d still like AWD.